Portability, sturdiness, and seating comfort. When it comes to the number of folding camping chairs available, the sheer volume can be overwhelming. It can still be tricky to isolate the above necessary perks when choosing a great product. Tired of cramming your behind into a camping folding chair that is barely big enough? Campers often compromise comfort for portability. After all, a roomy and super comfy folding chair would be too big to carry, right? Wrong. 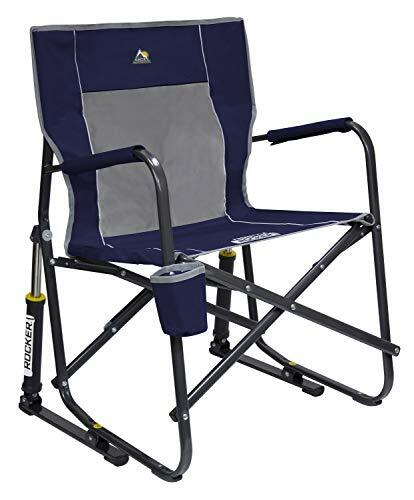 This Coleman quad camping chair combines portability with comfort perfectly. 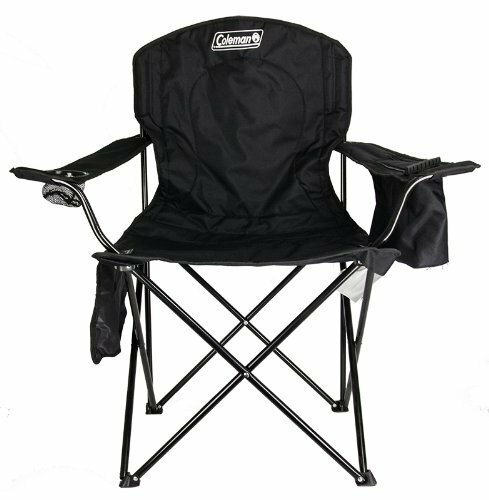 This camping folding chair has a large seat that you can lean back and relax to enjoy the outdoor views. The polyester material is super sturdy but doesn’t add any extra weight. The back and the seat are fully cushioned. The chair is easily collapsible just like any other folding chair. It has a mesh cup holder on the side to place your drinks. A small storage holder will hold on to magazines, shades, or even small cameras. The perks don’t stop there. The armrests are adjustable to ensure optimal comfort level. The chair has a heavy-duty steel frame. It can support up to 300 lbs of weight. Once folded, this camping chair can fit inside a standard car trunk. There are some minor problems, of course. The heavy-duty steel frame adds weight to this folding chair. It’s still compact and portable, but a bit weighty to carry. The armrests are height-adjustable, but they may sink in. There’s no frame support for the rests. But other than these issues, this may just be one of the best folding camping chairs you will ever find. The chair is 26 inches long, 35.4 inches wide, and 37.4 inches tall. It supports up to 300 lbs of weight. By all means, this is a large camping chair that will support you no matter your body type. But what does the “dual lock” description mean? Most folding chairs have a singular lock to secure the structure in place. The Kijaro chair has two locks instead of one for optimal security. That’s not the only amazing perk this product offers. This chair comes with a highly durable diamond ripstop polyester seat. It won’t sag! The mesh on the seat back is also highly breathable so you can say goodbye to annoying back sweat. This chair is available in an array of rainbow colors. It’s the perfect choice for people tired of black or camo green camping chairs. Though the seat is comfortable, users should be aware that there’s no head support. Tall people might find it difficult to support the back. There are several storage pockets attached to the chair, including two cup holders on each side. You can expect this chair to be on the heavy side. But it’s still highly portable thanks to the compact folding structure. This folding camping chair certainly pushes the envelope when it comes to features. Imagine if your camping chair could rock as well, just like a super comfy porch chair. With the GCI camping chair, you don’t have to just imagine. 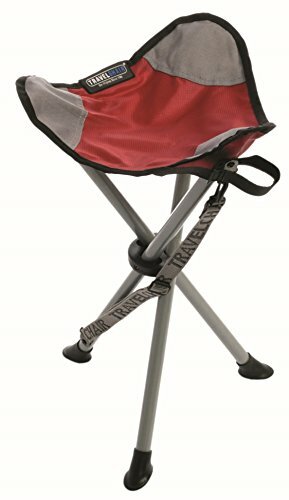 Not only does this camping chair fold, it rocks too! The chair is equipped with a patented rocking technology to ensure smooth rocking motion in outdoor areas. It can even handle rougher beach sand. A powder-coated steel frame. This rocker won’t corrode even if it gets wet. The seat measures at 24 x 25 x 34.8 inches. The chair can support up to 250 lbs. You have to sit up straight on this chair. It doesn’t lean back like grandma’s rocking chair. There are side cup holders that can double as phone holders. It’s a bit more expensive than regular folding camping chairs. But there’s a limited lifetime warranty to make this worth the price tag. The chair is heavier than usual because of the steel frame. But it still folds up in a compact package for easy transportation. This folding camping chair is not just for aspiring Hollywood directors. It combines many conveniences to optimize your outdoor trips. The frame of this folding chair is made from flat aluminum. So it’s a lot more lightweight than steel frame chairs. The chair barely weighs 10 lbs. Regardless of the lack of steel frame, this chair can support heavy people. The brand doesn’t specify weight limits. But you can comfortably sit in it if you weight between 250 and 300 pounds. 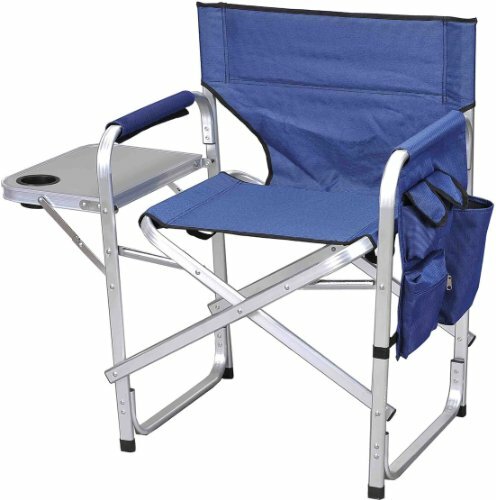 This folding chair comes with a retractable side tray and a multi-pocket storage hanger. On one side, you will get a small tray that you can use to rest your hand or keep food items. On the other side, there are multiple side pockets. Overall, the tray is useful and well made. But it may not always lock into position. One side pocket is a cup holder. Others have flaps to securely keep your belongings. The seat stands 17 inches high from the floor. It’s great for comfortable seating without your back being pushed down. 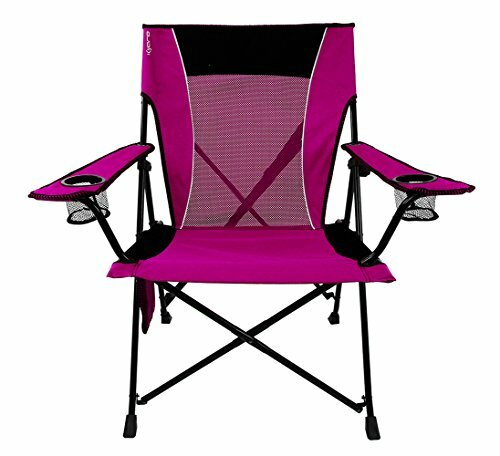 You can purchase this folding camping chair in an array of colors too. The price is really reasonable for all the features offered. As the name suggests, this is a great chair to just sit as you like on camping trips. Unlike the other chairs on this list, this one is more of a stool. The chair lacks a seat to support your back. Instead, it has a seat you can easily sink into. The price. This chair costs less than a family-sized pizza. It’s also one of the most lightweight and compact camping chairs when folded. The tripod mount can easily be folded up. Think of this chair more like a comfier version of a barstool than an actual chair. It will be very useful when you want to sit outdoors without any restriction. Musicians, artists, and other people who may need to hold large objects on hand when sitting down. Also, people with minimal space in their vehicles. Don’t think the tripod support is flimsy in any way. The material is reinforced throughout with nail heads. This folding camping chair is really sturdy, even if it’s super lightweight. It can support up to 275 pounds. There’s a Velcro closure to prevent the folded up chair from unfolding. Traditional chairs and portable models. Traditional types of camping chairs have a distinctly tall look. These chairs tend to have a lot of seat height from the ground. These chairs could also be a bit heavier. They may fold, but the chairs might be bulky and weighty to carry. These chairs are optimally designed to be as portable as possible. You can expect lightweight frames and compact sizes. However, these chairs may have lower seat heights. You may find the distance between the ground and the seat a lot closer than in traditional folding chairs. If you desire comfort above all else, then a traditional camping chair model is the best. But if you are more concerned about storage and portability, then a portable model is the best. It’s worth keeping in mind that most camping chair models these days embody a little bit of both. You will find wide seated traditional-type chairs that are also highly portable. Therefore, you don’t have to worry too much about what type of chair would suit your needs the best. Rather, make your judgment call based on the features. The folding camping chair may be sturdy, but can it actually support your weight? If you are on the heavy side, do pay attention to the maximum weight capacity of the chair. Most chairs these days can handle up to 300 lbs of weight. But the standard is still a 250 lbs limit. Make sure you are not buying a chair that will break easily. The size of the seat in width and length determines how comfortable it is to sit. If you have a considerable rump, you might want to take the seat size into consideration. It’s worthwhile to look at how high the seat is from the ground. This is a very important specification to look at if you are a tall person. The material indicates how sturdy and durable the folding chair would be. Also, it determines weight. A folding chair with a steel frame is very sturdy, but also weight. Alloy frames are more lightweight. The seating material is mostly made from a synthetic fabric like polyester on most camping chairs. But some may have canvas seating. Synthetic material like polyester is very durable and water resistant. These chairs won’t get dirty easily. If you buy a canvas or a linen folding chair, you might want to consider how washable the material is. Want to keep a coffee cup or your phone nearby while you enjoy an outdoor view? Folding chairs with cup holders and storage pockets can be very convenient for this reason. You can keep your clutter on the chair itself, without needing an additional table. Some folding chairs even come with retractable trays to keep your stuff. Undoubtedly, a folding camping chair with storage pockets is convenient for many reasons. If you are buying a folding camping chair with a steel frame, make sure the frame is powder- coated. Steel is vulnerable to corrosion. Pay attention to how the seat on the back is placed. You can lean on in some chairs, but not all. If you are looking for something truly unique, be on the lookout for features like rocking functionality. Most folding camping chairs have a multifunctional If you plan on using the chair for camping, at the beach, or in your backyard, look for the necessary features always. A warranty, even a limited one, will add more value to your purchase. The choices are nearly unlimited these days when it comes to folding camping chairs. You can buy products that are highly portable with useful features like storage pockets. It might be hard to make your decision, but always have the basic essentials covered before you buy. The folding camping chair must be sturdy enough to support your weight and it should have a well-placed seat. Then you can look for extra features like cup holders and a rocking function. Keep the tips given above in mind when shopping too.